Happy Birthday Sir Frederick Banting! Today is World Diabetes Day and people across the world are coming together to celebrate the research that has been done to help people with diabetes lead better lives. It is also a day to reflect on the work that still needs to be done to find a cure. World Diabetes Day is Friday, November 14th! World Diabetes Day was started in 1991 by the International Diabetes Foundation (IDF). November 14th was chosen for World Diabetes Day to honour Sir Frederick Banting, whose discovery of insulin along with Charles Best and the rest of his research team, made it possible to help people with diabetes lead more fulfilling lives. In 2006, the United Nations (UN) passed a Resolution marking World Diabetes Day as an official UN Day. It is now observed in over 160 countries around the world! The IDF and UN, along with their member organizations and countries, recognized that diabetes presents a serious threat to global health and is a disease that cannot be ignored. The aim of World Diabetes Day is to bring awareness to the disease and the impact it has on all of us. There is also a focus on finding ways to prevent diabetes along with the complications many people with the disease encounter. Not only is the number of people with diabetes on the rise, but diabetes has an impact on our society and economy because of these complications, including increased medical expenses. Although being diagnosed with diabetes is no longer a death sentence like it was before Dr. Banting’s discovery, it still has a large impact in our world today. To help bring people together and raise awareness to diabetes and its effects, the Blue Circle was created out of the process that led to the UN resolution. It is a globally recognized symbol that helps to bring people together and reminds us that we have to work together to make a difference in the quest to put an end to diabetes. This year, the IDF’s theme for World Diabetes Day is how healthy living can help with diabetes, and their campaign, “Go Blue for Breakfast,” focuses on just that. The Canadian Diabetes Association is also emphasizing how healthy eating can help people with diabetes manage the disease, and can also lower people’s risk for developing Type 2 diabetes. To tie into these campaigns, our celebration tonight at Banting House NHSC will include some helpful tips on putting together a healthy breakfast to start your day off right. World Diabetes Day gives us the chance to remember the work that Dr. Banting did to dream up and develop insulin, and we are celebrating in style! We would love to see you out at Banting House NHSC tonight from 6:00-8:00pm as we participate in the Blue Monument Challenge by lighting Banting House up in blue, and as we take a moment to reflect and celebrate on Dr. Banting’s accomplishments. We will have a scavenger hunt for kids and a chance to make a “Birthday Card” for Dr. Banting. There will also be cake and hot chocolate! Please come and join us, we’d love to see you! 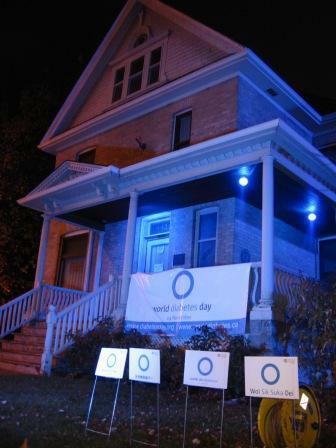 Banting House lit up in blue for a past World Diabetes Day. Posted in Uncategorized.Tagged Banting House NHSC, World Diabetes Day.